Her main areas of practice include general corporate matters, financial institutions, mergers and acquisitions in the insurance and banking industries, distribution and sales representative laws, insurance and healthcare services, regulatory matters and government and legislative affairs. 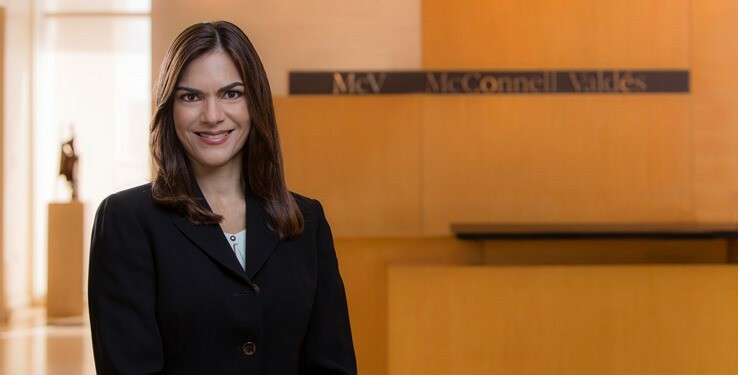 Before joining McConnell Valdés, Mrs. Portela concentrated in the practice of civil and commercial litigation in federal, state and administrative forums, including appellate practice. One of the main areas of her practice was in insurance matters being the outside counsel for the Office of the Commissioner of Insurance of Puerto Rico and the Puerto Rico Health Insurance Administration. In addition, in 1993 she served as Assistant Legal Advisor to the Governor of Puerto Rico on issues of public safety. In 1994, she served as the Legal Advisor to the Secretary of the Department of Correction and Rehabilitation. As such, she worked extensively on public policy issues and government affairs. Representating health care facilities in certificate of need litigation before the Puerto Rico Department of Health. Representing insurance companies in administrative proceedings before the Office of the Commissioner of Insurance and of health care facilities before the Puerto Rico Health Insurance Administration. Asset purchase transaction by and among Triple-S Salud, Inc, and La Cruz Azul de Puerto Rico, Inc.
Asset purchase transactions by and among insurance producers. Stock purchase transactions involving international insurer operating as a protected cell company. Transaction involving acquisitions of a software development and data processing entities in Central America and Puerto Rico. Assisting in representation of insurance company in negotiations with several PR government agencies in relation to termination of insurance program for the Municipalities of Puerto Rico. Government affairs/lobbyist for leading insurance company.